The first picture is my completed panel and frame perched on my kitchen table. The second picture should be called After and Before, as Shiprock after my marquetry efforts, and Shiprock before attemping marquetry in my working photograph. The third picture is my glitzy satin display photo, as is the fourth picture showing the panel and frame separately. Glitzy, isn’t it? This is my first attempt at marquetry. The frame for the marquetry panel is made of walnut. I applied veneer to 1/4-inch birch plywood. Including the frame this project is 10 1/2 inches wide and 10 inches tall. The veneer I used to represent the sky is cherry veneer. 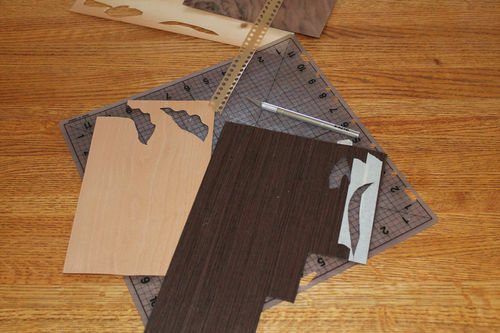 I used veneers I purchased in a sample pack that did not identify the species of wood used. Two types of dark veneers were used to make the rock formation. I think one was walnut burl. The other was a very nice brick red color. The flying eagle was cut from a piece of black veneer. I simply do not know the varities of these veneers. The finish on this project is amber shellac. I have greatly admired marquetry projects posted by other Lumberjocks. Shipwright is a maestro at marquetry. I poked around on the Internet and discovered on comment that said beginner picture marquetry always shows a mountain, a lake, and a tree. Well, one out of three is all I got. Here is the story of this panel. I live in the Four Corners of the United States, that is, the area where New Mexico, Arizona, Utah and Colorado meet. My home is located in northwest New Mexico. I have lived here almost my entire life, and almost every day I can look to the west and see Shiprock. I live on a family farm consisting of approximately 300 acres that borders the San Juan River. Bald eagles roost in the trees on our farm in the winter. Shiprock is all that is left of an ancient volcano and sits on the Navajo Reservation. The Navajo call it Tse’ Bit’ A’i(pronounced sort of like Say Bit Eye), which means “rock with wings”. According to Navajo tales, a great bird carried the ancestral Navajos from the far north to their current homeland in the American Southwest. The ancient Navajos were fleeing from another tribe so shamans prayed for deliverance. The ground beneath the Navajos became a huge bird that transported them on its back, flying for a day and a night before landing at sunset where Shiprock now sits. It rises to a height of 1600 feet. White settlers (the Navajo would call people of Caucasian ancestery bilagaana) came to the area and called the peak Shiprock because of the idea it looks like a clipper ship under sail. 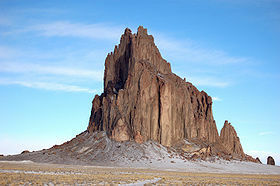 For Lumberjocks who are also movie buffs, Shiprock has been filmed several times. “The Lone Ranger” with Johnny Depp, “John Carter”, “The Host”, and “Transformers” have shots of Shiprock. And for people who watch the oldie goldies, “The Hallelujah Trail”, made in 1965, features my beloved rock. At any rate, Shiprock is a landmark that means home to me. I first tried the window method marquetry and had moderate success, but mostly I got a sore index finger from the way I held my Exacto knife. Next, I tried the double bevel marquetry with a marquetry donkey and a fret saw. This proved to be a lot of fun and I was quite pleased with the marquetry cuts. Double bevel marquetry is the technique I used in this project. I also used a little bit of sand shading. This is my first attempt at marquetry. Fellow Lumberjock, Shipwright, has created beautiful marquetry and has posted wonderful blogs on the subject. The quality of his work is the standard I would like to achieve someday. That will definitely takes lots of practice and a chevalet. Lastly, if you follow my posts on Lumberjocks, you may recall that I have written about my brother. 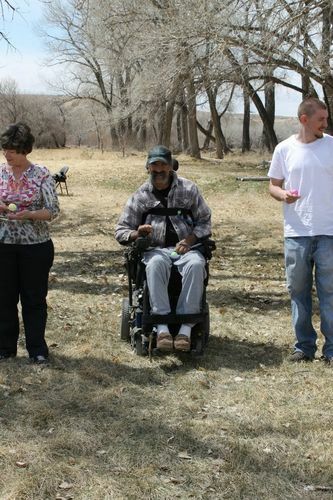 He was injured the day before Thanksgiving, 2011, suffered a spinal cord injury, and is now confined to a wheelchair. When he was still in the Intensive Care Unit of the hospital, he asked for a picture of a flying eagle that he keeps in his room. That picture also had a verse from the Bible on it: Isaiah 40:31, But they that wait upon the Lord shall renew their strength; they shall mount up with wings as eagles; they shall run, and not be weary; and they shall walk, and not faint. He still has not managed to walk, but he has overcome many things. I took this picture last year at our annual Easter egg hunt and picnic. He has his egg on a spoon in his lap and is ready to join everyone else in the egg race. The bottom line is, no matter how lousy things may be, if I remember God, I can make it through. Life is good. Great job. 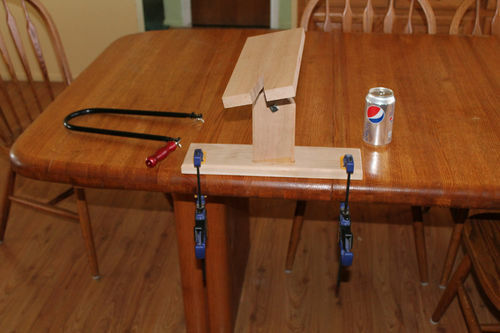 I was just going to recommend Shipwright and his blog. Then I read your post again. Very attractive and nice story. Thanks for sharing. I have never tried this. Looks like fun. Great first attempt Grace, better than mine. All it takes from here on in is …..... you got it …..... practice, practice, practice. You obviously have the artistic talent and the interest so I have no doubt that you will improve very quickly. Don’t hesitate to ask for help with anything. Again great job, you’ve put emotion into a picture of a rock …..... that takes talent. Beautiful piece, simple, clean, effective. Great work Grace, especially for a first. Everything about it looks genuine and well expressed. Marquetry is a wonderful way to work with wood, and a lot of fancy tools and space are not necessary to do even the finest work. I’m looking forward to seeing more of your work in the future. Nice piece. Welcome to marquetry. I look forward to seeing future projects.